If you are in law enforcement or military or someone who loves firearms, getting you a drop leg holster is worth the investment. The holster is mostly used for tactical purpose that involves hunting or range, with the holster clasped tightly around the foot. It is easily accessible. It is not easy to choose best drop leg holster from such wide variety but this guide grabs the best three products to help you make your selection. 1 Why Should You Buy A Drop Leg Holster? Why Should You Buy A Drop Leg Holster? There are various types of holsters but if you are majorly into outdoor activities and want to wear something tactically, it is the best option as it can be clasped tightly around leg or thigh. It is easier and convenient to carry many weapons or firearms at a time using this type of holster which is why the holster is popular for military purpose. It gives easy access and instant withdrawal of the firearm. The drop leg holster are great for people who are into ranging and involve in outdoor adventure activity as it is convenient to buckle up the holster around legs. When it comes to leg drop holster comfort and convenience is very important as it is used for tactical purpose. The holster should be able to retain the gun well and enable ease of access when needed. Here are some features you must check before purchasing the gun. Adjustment – Since it is tied around the leg, it is very important for the holster to cling on tightly. The holster should have Velcro straps and strong buckles that enable quick and easy adjustment of the firearm to the holster. On adjusting it properly, it is able to retain the position of the firearm appropriately. Comfort – Before investing on it, the comfort while strapping on the holster to the leg should be checked properly. It should be comfortable as it is mostly used for tactical purpose and should not let the wearer lose balance. Movement – The gun or firearm movement while inside the holster should be less through strong strapping and adjustment. The movement should be less as it endures better use and access of the gun. It is a strong and sturdy piece of drop leg holster which is mainly used for special operations and other tactical purpose. The belt hanger is adjustable or can be removed accordingly to hold the gun tightly. It is designed for fit perfectly large to medium sized pistols and full control on your weapon is provided with the help of double thumb break security system. The strap and buckle system is non-slip in nature and can be efficiently adjusted. The tactical based gun flaunts very stylish and efficient wrap around design that fits various types of pistols. It has great retention system and the gun can be held tightly with help of adjustable Velcro strap. The holster is capable of holding both medium and small sized pistol and comes with fully adjustable leg strap which has great grip with its non-slip attributes. The straps are customizable but at times it gets difficult to adjust its tightness. The product boasts of comfort and convenience with its adjustable strap and design. 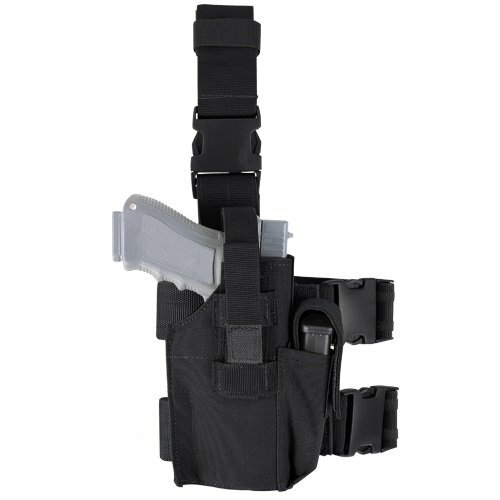 The holster can be used for universal operation and tactical purpose and is mostly convenient for use on right thigh and access using right hand. The straps are non-slip and adjustable with maximum comfort that minimises the movement. 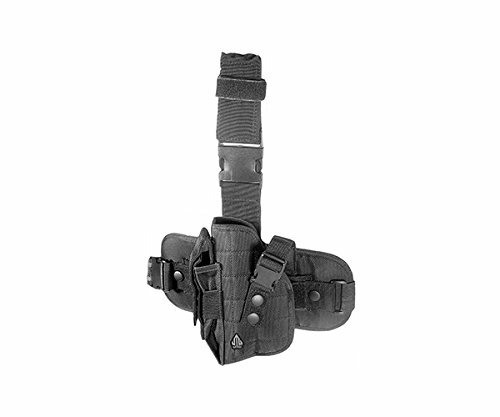 The Velcro strap of the holster makes it easy to adjustable and versatile design fits various types of guns and pistols. 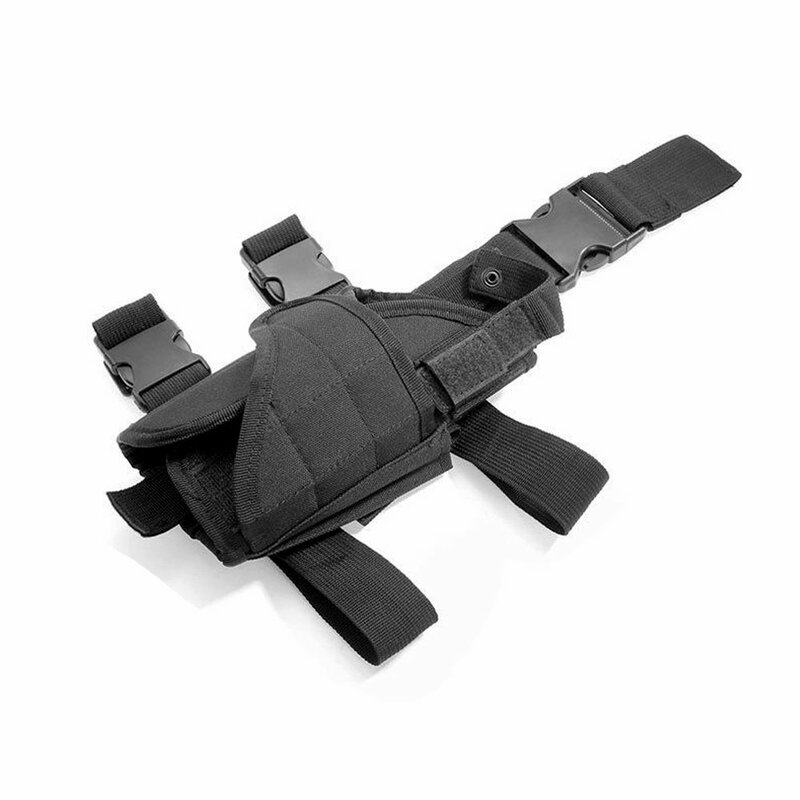 The holster is customizable and can be attached to wrist belt and fasten to leg. The holster is mostly used for tactical and outdoor purpose which is why it is important to find out your requirement and find the suitable one. It is not easy to find a good drop leg holster without guidance, so this guide will assist you in finding one suitable for your need. All the reviewed products are tested and tried personally and used by people before jotting down the pros and cons. On making a comparison amongst the best drop leg holster reviewed here, Condor Tornado Tactical Leg Holster is the most suitable one as it can be adjusted, equipped with Velcro strap and buckles and worn efficiently with utmost comfort. It can be used for various tactical purpose and outdoor activity and gives ease of access and use.